Do you prefer ninjas, or pirates? How about history, or steampunk? Here’s an idea: why not have both? Okay, strictly speaking this isn’t a novel about either ninjas or pirates; it’s a story about Japan’s “opening” to the west when Commodore Perry of the U.S. Navy sailed into Edo Harbor in 1853 and threatened and insulted the Japanese into negotiating with him, or else face bombardment from his entire fleet, which he brought back in 1854. Japan was unprepared for this aggression, the country having been isolated and controlled by the Tokugawa Shogunate for the past two and a half centuries: their military was still mostly medieval, and could not fight back against modern warships, steamships, cannons, and rifle-carrying Marines. But what if? What if Japan had found a way to be ready for that attack? What if the nation, alerted to the threat of the West by the actions of the British in opening and conquering China and India, had modernized and industrialized? What would have changed in world history if Commodore Perry had found the harbor blocked, and armed, the Japanese a growing world power, perhaps even a legitimate threat to the US? I’ll tell you what: that would be a story worth reading. And so it is. Stephanie Sorensen has found just what the alternate historian needs: a critical moment when world events went in this direction instead of that, and then thought of a way to make it go that way. The change is in one man (as history’s pivotal moments so often are): Himasaki Toru, a fisherman with something of a mysterious past, who is lost in a storm and rescued – by an American whaling ship. Toru spends two years in America, and while there, he realizes that the US, with its military and economic might, and its brash disregard for the slow grinding of polite diplomacy, could pose a threat to his motherland. A faithful son of Japan, Toru has only one choice: break the Shogun’s law that bans anyone from entering Japan from the West on pain of death, and find a way to convince his nation to adopt Western technology and industry so that when the US comes, Japan would be ready. It’s an impossible task, made even more so by the fact that Toru is only a peasant, a fisherman; no nobleman, no daimyo, no samurai would ever listen to one such as he, let alone the entire nation. But only the efforts of the entire nation, working in concert, can possibly give Japan the chance to meet the West’s incursions from a position of strength. Toru works with the weapons he has: his intelligence and his passion; the books and machines he purchases in the West and tries to smuggle back into Japan; and a rebel’s greatest weapon: luck. Toru is lucky that the lord whose domain he lands in, Lord Aya, is himself unconventional, made so by his unconditional love for his unconventional only child – his beautiful daughter Masuyo. With luck, and with the help of Lord Aya and Masuyo, maybe Toru can save his country. I liked this book. 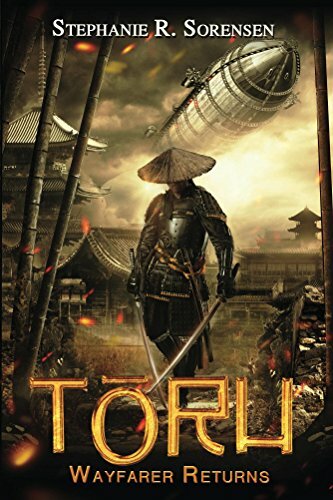 I mentioned pirates and ninjas above because this book combines some of the best features of both: Toru is a rebel, though one with a good heart and good intentions; he breaks the rules because he has to, to succeed. Like a pirate. Masuyo does this even more, as she refuses to meekly accept the role of women in her culture; she uses her brains and her courage to help Toru in his task, and takes her place in the forefront of this revolution against the status quo. As for ninjas – well, the story is set in 19th century Japan. There are ninjas. There are samurai, and swordfights, and honor. And then, because it is steampunk, there are trains, and telegraphs, and Babbage Difference Engines, and dirigibles painted like dragons, powered by steam engines, swooping down out of the sky to awe and terrify allies and enemies alike. Honestly, Sorensen, who has a background in Japanese and Asian culture and studies, does a better job with the Japanese aspects than the steampunk aspects; the steampunk isn’t bad, but it isn’t really the focus. The focus is on the culture of the Shogun’s Japan, and how change could come to such a rigid and traditional culture, and what would happen when that change did come. As a novel of alternate history, this is a good book. As a steampunk book? It’s okay. The dirigibles are really cool. The writing is generally good, though not spectacular. The industrialization of Japan within the timeline and despite the cultural roadblocks requires some suspension of disbelief, but I thought the political interactions were well done, both within Japan and then between Japan and the US. But anyone interested in Japan, in samurai, in traditional cultures, or in the clash between tradition and modernity – you should read this book. And the sequels, when they arrive. And anyone who likes a well-written story of one man struggling both for and against society, anyone who is interested in the struggle to break out of a rigid class system and become more than the role created by one’s birth, you should read the book, too. Oh – and if you like romance, there’s some of that, too.